Ah, the theater. What better way to spend the evening than enjoying classical performances from musicals to comedies, ballet, and more? 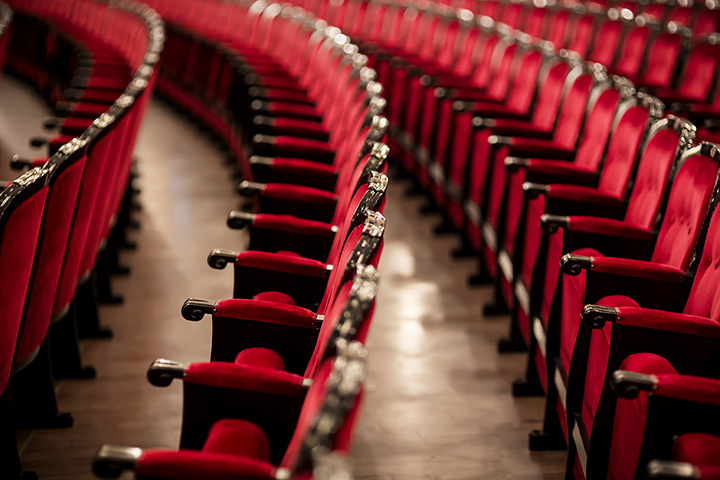 If you are a lover of the arts and looking for some outstanding entertainment, be sure to check out these 10 best places for live theater in Indiana! Located on Monument Circle in the heart of downtown Indianapolis is the Hilbert Circle Theatre. Built in 1916 with a Neo-Classical Revival-style, and inspired by the ancient Greek and Roman arts. With its 18th century style, the Hilbert Circle Theatre is a massive and magnificent structure. The stage is large and open, and the acoustics are like no other. The Hilbert Circle Theatre is home to the Indianapolis Symphony Orchestra, but other performances are given here as well. The Kokomo Civic Theatre has been giving the city of Kokomo spectacular performances since 1949. They seek to provide quality amateur theatre to the city and its neighboring communities while bringing the best in live theatre. The goal is to provide a creative outlet through the arts for everyone in the community. With 4-5 shows a year, the KCT performs at Havens Auditorium, the main stage for Indiana University Kokomo. The Civic Theatre of Greater Lafayette is one of the oldest, active theatres in Indiana. It was originally founded in 1931 as Lafayette Little Theatre before being recognized and renamed to the Civic Theatre in 1966. The goal of the theatre is to enhance and educate the greater Lafayette area in the cultural world of arts. Every year, the theatre produces five “Main Stage” productions at the Historic Monon Depot Theatre, founded in 1980. There is also a youth theatre group for children 18 and younger. The theatre offers classes and camps throughout the year for those interested in the performing arts. Head on over to North Vernon, Indiana, this summer to the Park Theatre Civic Centre. When the theatre originally opened in 1916, it was the home for vaudeville acts and silent films. When you walk into this magnificent structure, it’s almost as though you can feel the history seeping through the walls. With 330 seats and a wraparound balcony, as well as the original brick wall, tin ceilings and art deco lighting, you almost feel as though you’ve stepped through time just a bit. The theatre is known for its low-ticket prices and being family friendly. It also doubles as a movie theatre in addition to live productions. Come visit the Dunes Art Foundation in northern Michigan City, Indiana. Another not-for-profit organization, the Dunes Art Foundation began its career in 1952 in the Harbor County Theatre. The site itself is spectacular. Located on a 20-acre wooded site, roughly a half mile from the Michigan dunes and the lake shore on the border of Indiana and Michigan, this theatre seats over 240 individuals on any given day. There are also 12 cabins for summer actors and interns, as well as an outside pavilion for performances. Employing some of the finest performers in the greater Chicago area, TATC puts on some the most amazing shows year-round. From musicals to comedies, new plays and more, TATC is committed to bringing the performing arts to the entire Munster community. TATC was established in 1990, one of the largest with over 400 seats available. It has the feel of a classical opera house mixed with a concert venue with its round room seating and a large stage that spreads across, followed by a smaller stage in the center. TATC is a not-for-profit organization, operating on grants, individual donations, and support from the Community Foundation in northwest Indiana. The Chicago Street Theatre in Valparaiso, Indiana, recently celebrated their 62nd year of producing amazing, first class, live theatre for Northern Indiana. Originally located in the Memorial Opera House, the company purchased the Chicago Street Theatre (ironically located on Chicago Street) in 1997. The theatre is open to anyone who wants to participate, whether it is on stage or behind the scenes. Check out their “One Night Jam” series in which many talents such as Gretchen Peters, Michael McDermott, Lou Sampou, and Cathy Richardson have come to perform, live, for the residents of Valparaiso and Indiana. The venue has two types: Mainstage with VIP comfy couches (and pictures with the artist), or the Edith Wood setting, which offers a more intimate, in house concert type of setting. Head over to the small town of Warsaw, Indiana, for some great live entertainment. Another one of Indiana’s oldest theatres, it is best known for their high-quality products and concerts. The theatre also has a unique, concert like venue in its structure. The room itself is round with overhead lighting, the stage centered and the seats situated round the room. It provides a more intimate experience during performances. View more Indiana Theaters and Playhouses.